I’ve always liked Street Fighter and other 1 on 1 fighting games, there’s a standard there that you can understand. In my youth characters like E Honda, Blanka and Chun Li always stood out to me because of their ease of use (mash one button repeatedly to win). A few years ago things changed however, I started actually looking at move lists and assigning them to memory. I understood basic concepts of fighting games of zoning and I’ve come close many times to actually having an opinion on frame data. A big problem with fighting games is that there isn’t a huge amount of room for advancement in the genre. Sure we have dress up in Injustice, Power Stones / Gems in Marvel Vs Capcom 4 and Street Fighter has Birdie, but none of these are grand departures for the genre. Step up Senko no Ronde 2 to drop some crazy into the Kool-Aid that is the fighting game genre. Senko no Ronde 2 seems perfect for something I’ve been talking about a lot on PixelBedlam over the past few months, the concept of genre mash-ups and how they can produce some of the most interesting advancements to a game in lieu of new mechanic hooks. 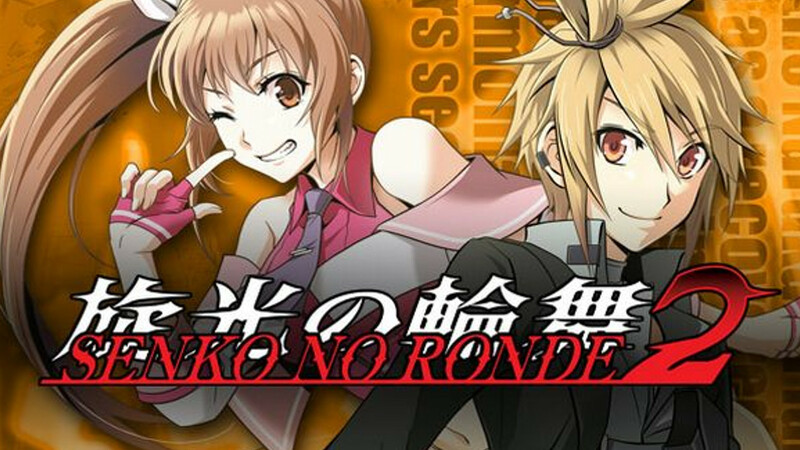 Senko no Ronde 2 brings you a fighting game crossed with a bullet hell shooter. 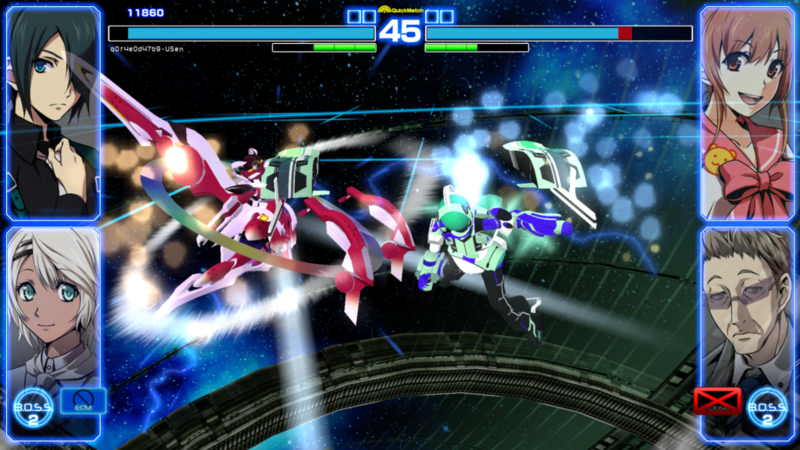 Two players face off in mech suits piloted by anime characters in a Zero G field. When close to each other the camera zooms into a standard side view to allow for some melee grappling, but when further apart the game goes top down for some fascinating fighting. Every melee button is now replaced with different weapons allowing for a chaotic scene where at a moments notice the screen could be filled with a hundred hurt filled bullets spiralling in all directions. 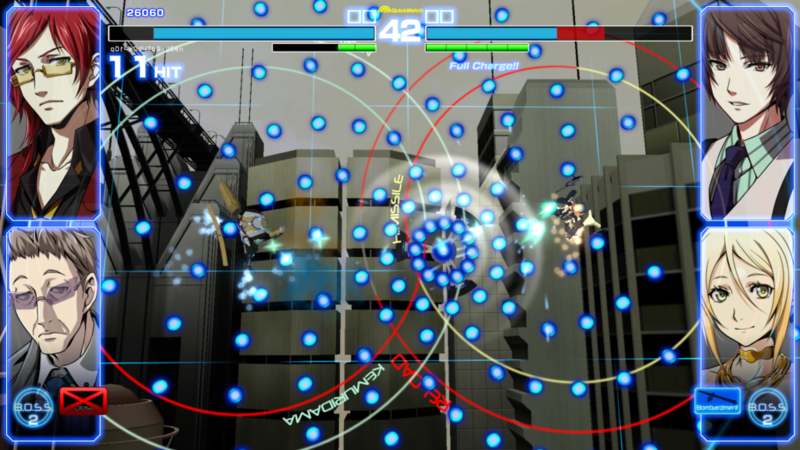 At this moment the player has two options, dodge them or block and melee their way through them towards the enemy. 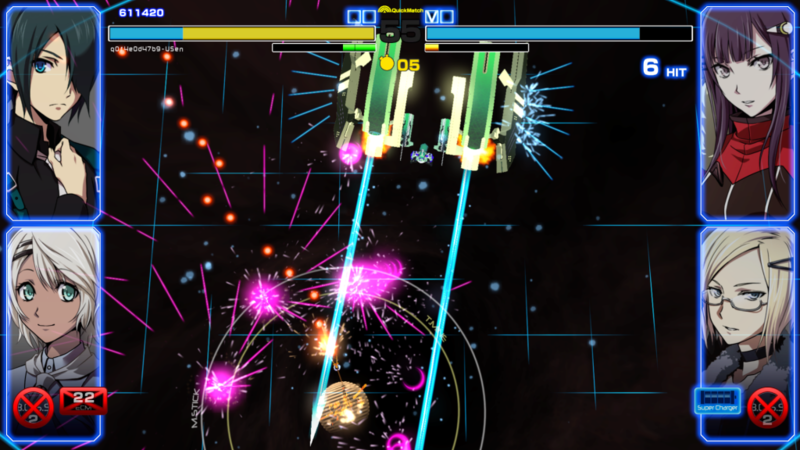 Within the restricted playing field the game can lead to some beautiful scenes as coloured orbs fly around whilst two mechs attack each other. This might be feint praise but the game reminded me of Psychic Force on the PSone way back when with its playing with gravity and disregard for fighting game standards but there is a slightly more unfortunate comparison to be made, and that’s graphically. This is technically a reboot/remaster of a last gen game being released on PC and PS4 and it seems to have carried over graphics that aren’t up to the standards you would hope for today. The highly polygonal characters do have a certain style to them and there’s no denying that when all hell has broken loose the game holds its frames perfectly but you can’t help but feel like when the camera zooms in for some close up action you are playing a game from the ps3 at best but realistically something you’d expect more on the PS2. It would be hard to ignore this game’s difficulty, single player seemed particularly tough and despite knowing controls and having played the game for a while there definitely seemed to be some difficulty curve issues even against another player. Buttons and the game on a whole is explained to you and is enough to start with, but with the single player difficulty ramping up at such a rate I needed some more concepts and strategies for a new player to use. And that’s a key problem with Senko no Ronde 2; New players are not being catered for. It’s a tough sell at any level. It’s surprising to people who only know Street Fighter and Mortal Kombat but there are actually quite a few fighting games coming out each year, mainly from Japan. And a lot don’t really get anywhere because they struggle to engage new and casual players. Throughout my time with Senko No Ronde 2 I always felt on the cusp of understanding it and then I realised I was just having to rely on button mashing to get anywhere or spam one move over and over. There is a B.O.S.S. Mode for each character, essentially a meter burn move that brings out a super big version of your mech to just destroy your opponent, especially if your mech has lasers which are OP to the Nth degree. How long you have with your B.O.S.S. mode is dependant on how much health you have leading to a maximum of 12 seconds of crazy time. It’s another great concept and mechanic in a game that seems to think you have cooties and refuses to hold your hand. The single player is basically a visual novel with more text than war and peace that at least mixes up the monotony of reading with some really cool fights that throw in some win modifiers that change how you need to play the game for a round or two.